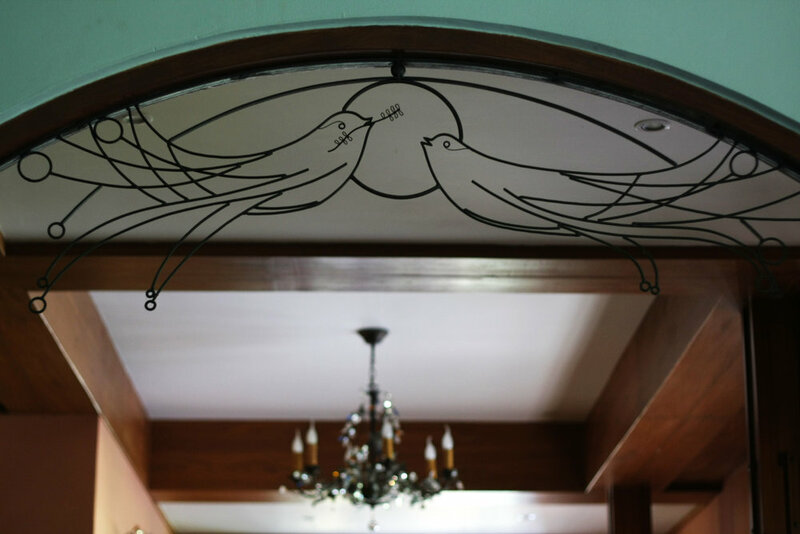 Enter the Manor House through teak doors, encased with stained glass panels, the foyer being the center point of the house. From this entrance, an elegant marble and wrought iron "peacock" stairway leads you to the upstairs bedrooms. On the ground floor you'll discover a relaxing living space with plenty of room for you to chat with friends and sip on your favorite tea flavor. 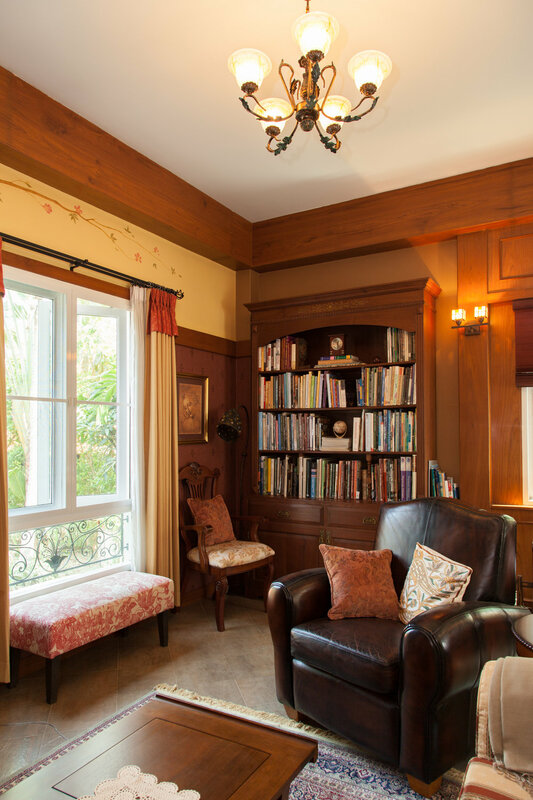 Adjacent to this living room is our library and entertainment room, a cozy space sure to keep you occupied on any rainy day. A gourmet service kitchen featuring a European copper stove hood and stained glass cupboards are accentuated by a counter bar for group gatherings. Walk past the sitting room to find a half circular fine dining room with exterior walls made by natural stone. Lastly, you'll find a sitting area with large bay windows and cozy nook that looks onto a tranquil view of the gardens, the surrounding forests and hillsides. Much of what we have in the house revolves around a careful selection of European and New World vintages, in the sense of relaxing, eating well, sleeping comfortably and just enjoying a time out. We believe the best accommodations are the ones that is shared with others and our home fosters that ideal. However, when you want to retreat back to privacy, head back to your room and find comfy beds, natural linens. Our spacious dining room, with its vaulted ceiling and bracketed by wood beams, is one of our most beloved focal points. During the day, it can serve as a private function room for anniversary and birthday celebrations, corporate meetings and even photoshoots. At the end of the living room, passing through an arched doorway, you'll discover our library which features an eclectic collection of books, magazines and DVD's from your host's many years of international travel.